You are here: Home / Health & Diet / Say Cheese To Cheese And Its Amazing Health Benefits! Say Cheese To Cheese And Its Amazing Health Benefits! Cheese is a dairy product loaded with nutrients that benefit your health. It is interesting to note that there exist over 4,000 varieties of cheese as it is available in a number of flavors, and textures. It can be prepared from the milk of cow, buffalo, goat, or sheep. Simply put, cheese is a type of curdled milk. It is rich in high-quality protein, fat, calcium, and phosphorus. Being a good source of calcium, it is beneficial for building strong bones and teeth as it helps maintain good bone density. Plus, protein helps maintain strong muscles. In fact, the nutrients present in cheese avoid the build-up of acid on your teeth after the consumption of sugary foods. Thus, it has anticariogenic properties. In addition, it stimulates saliva and hence, assists in reducing dental problems. It strengthens the tooth enamel and promotes the deposition of minerals like calcium and phosphorus in teeth, thereby reducing demineralisation, which contributes in tooth decay. So, you can have cheese with, after, or in-between meals. Furthermore, this milk-based food product contains vitamin A, vitamin B2, vitamin B12, magnesium, potassium, selenium, zinc, etc. It can be considered as a concentrated source of getting the nutrients present in milk. It boosts the immune system, prevents osteoporosis, reduces the symptoms associated with PMS (Premenstrual syndrome), and protects your skin. Moreover, soft cheese and cottage cheese contain probiotics that aid in digestion and help improve the overall metabolism. It is believed that diets laying emphasis on the inclusion of dairy products like cheese in moderation help maintain lower body weight as they tend to suppress the appetite. Here’s a short video explaining the health benefits of cheese against cancer. Though prepared from milk still, certain varieties of cheese are well tolerated by individuals suffering from lactose intolerance. 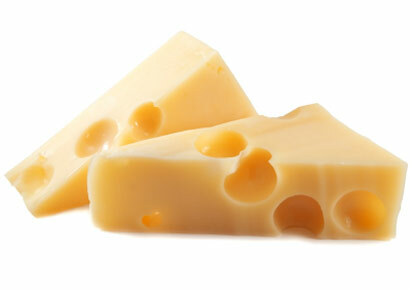 For instance, they can have hard or aged cheeses such as Swiss, Cheddar, Parmesan, Edam, Monterey Jack, etc. Besides, you can opt for products like lactose-free yogurt cheese, soy cheese and tofu cheese. However, you should avoid having cheese made from raw, unpasteurized milk. Similarly, you can try Ricotta, Swiss, Monterey Jack, Port de Salut, or low sodium variety of Mozzarella, Cheddar, and so on if you want to restrict salt in your diet. Low-fat varieties are also available. Cheese is usually made by acidifying the milk and adding rennet in it. As rennet is considered to be an animal product (it is extracted from the stomach of an unweaned calf or some other animal), there are vegetarian alternatives to it. Being rich vitamin B12, it is good for vegetarians as they are prone to deficiency of this vitamin. The Dietary Guidelines for Americans recommend that individuals aged nine or more should take three servings of low fat or fat-free milk, yogurt or cheese per day. One serving of cheese includes 1.5 ounces of hard cheese or 2 ounces of processed cheese. Recent studies have shown that though rich in saturated fats, dairy products help lower the chances of developing heart disease and type-2 diabetes. Furthermore, it is believed that being rich in CLA (Conjugated Linoleic Acid), cheese can help prevent certain types of cancers. CLA is a healthy fat that helps fight obesity, too. Cheese prepared from the milk of grass fed cows has high amounts of this fat. On the downside, individuals suffering from migraine may avoid having aged cheeses as they have been known to trigger migraine headaches.